Here in the Pacific Northwest it rains. A lot. So when we get a nice day or weekend we have to take advantage of it. Because we never know when it will come again. 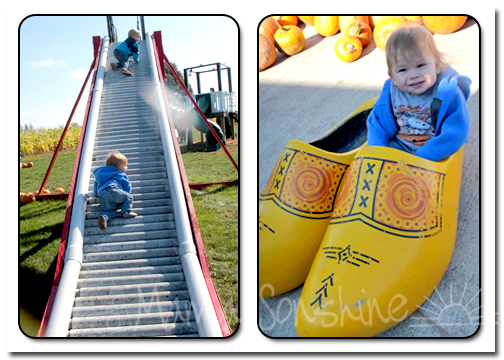 We had a gorgeous day on Sunday so off to the pumpkin patch we went. We are scheduled to go to the pumpkin patch with Ian’s school. I was afraid it might rain that day which would be bad for Baby Sid. I didn’t want Baby Sid to miss out, so this year we will have two pumpkin patch visits in the scrapbook. Ian’s favorite thing was this slide, once he tried to climb up it, and so did my little climber Sid. I am pretty sure Sid would have climbed to the top if I had let him. Categories: Cooking, Food, Homemaking, Meal Plan Monday, Outings, Parenting, Recipes | Tags: Cook, cooking, Dinner, Kitchen, Meal Plan, Meal Plan Monday, Meal Planning, Menu Plan, Menu Plan Monday, Menu Planning, Motherhood, Org Junkie, Organizing Junkie, Pacific Northwest, Plan to Eat, postaweek, Pumpkin Patch, Recipe, recipes, Slow cooker, what to cook | Permalink.